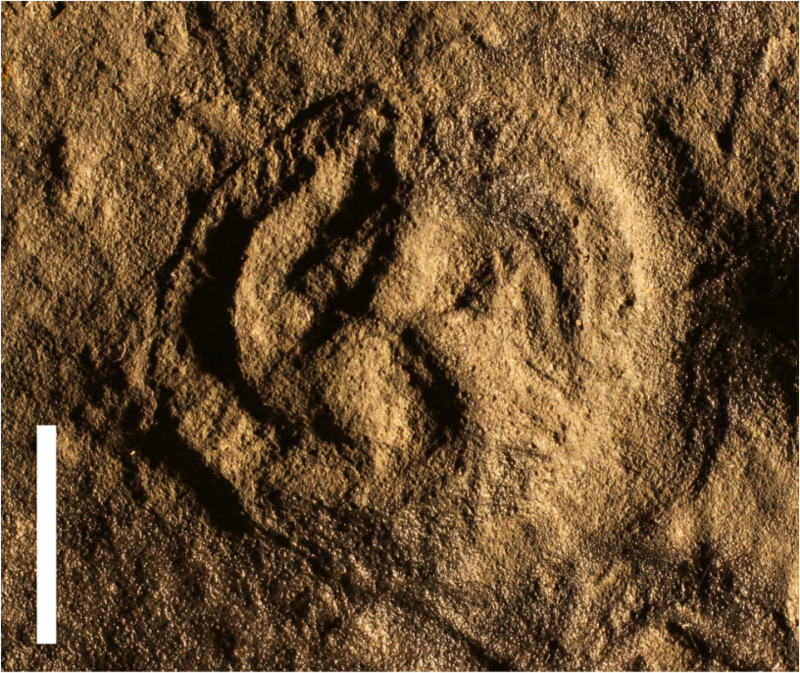 Numerous Ediacaran fossils are radially symmetrical, and appear to be biological organisms in their own right (as opposed to being the circular holdfasts of other Ediacaran organisms). These taxa have been broadly categorised as Radialomorphs, as they all display some form of radial symmetry. The most simple Radialomorphs are circular, and possess simple radial symmetry. These include the taxa Eoporpita, Inaria and Mawsonites. More complex forms display structured radial symmetry, including three-fold (tri-radial), four-fold (tetra-radial), five-fold (penta-radial) and eight-fold (octo-radial) symmetry. A recent study of the tri-radial symmetry seen in Rugoconites and Tribrachidium as well as several other fossils not featured here, has shown that they are morphologically similar enough to be considered a clade of related organisms (Hall et al. 2018). Triradialomorphs include the genera: Coronacollina, Albumares, Rugoconites and Tribrachidium. Tetraradialomorphs include Conomedusites, which has been compared with living Cnidaria (the group comprising modern jellyfish, box jellyfish, sea anemones and sea pens). Pentaradialomorphs include the taxon Arkarua, which has five-fold symmetry, similar to living echinoderms (e.g. starfish, sea urchins and sand dollars) that you might find in rock pools today. Arkarua is known primarily from South Australia, although possible specimens have also been found in southern Siberia (Liu et al., 2013). Eoandromeda is the only Ediacaran organism known to possess eight-fold radial symmetry. Its general appearance, and the presence of features interpreted by some as comb rows, has led to comparisons with living ctenophores (a pelagic animal group commonly referred to as 'sea gooseberries'). The tri-radial fossil Tribrachidium. Specimen from latex cast, South Australia Museum, P49372. Scale bar = 1 cm. Modified from Coutts et al. (2016).